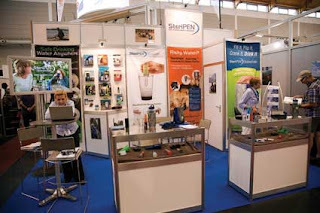 SteriPEN showcased the latest Freedom water purifier — their smallest, lightest and first rechargeable UV water purifier — which will be available in South Africa through Ram Mountaineering at the end of 2011. The SteriPEN Freedom can be recharged using a computer, AC outlet or compatible solar charger via a micro USB port and can also be used as a convenient LED flashlight. It is 13cm long, weighs a mere 74gm and destroys over 99% of bacteria, viruses and protozoa in just 48 seconds for 500ml of water at a time. It can purify up to 20L of water on one battery charge, which takes approximately two hours to recharge. Just be aware that you have to use rechargable batteries as normal batteries do not hold enough power. The Freedom is aimed at the business traveller.